Just as there's a right tool for every job, there are plenty of wrong tools for the same job, not to mention others that might work alright but should be used only in a pinch. Duct tape is a case in point. It's great for taping virtually everything on the planet, but it's lousy for taping ducts. Here are some of the most commonly used and oft-recommended items for home repair and maintenance tasks that are in fact the wrong (or at least not the best) tools for the job. Like most other plastic tapes made for temporary projects, ordinary duct tape is highly prone to drying out and delaminating, leaving you with a residue of crusty crud, a loose flap of plastic, and no structural bond whatsoever. And what better surface for drying something out than a hot-air duct? 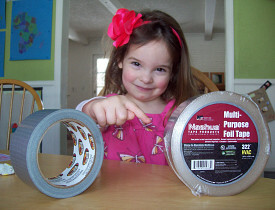 The right tool for the job: Foil tape designed for sealing HVAC ductwork. Highly toxic and only marginally effective, liquid drain cleaners fail time and again, leaving you with a sink-full of poisonous solution to deal with when you or your plumber has to clear the drain manually. Interestingly, one of the leading brands of drain cleaner recently began selling a drain-cleaning tool (much like a Zip-It) along with their liquid product. Isn't this obviously admitting that their product doesn't work all that well on its own? The right tools for the job: Zip-It or other flexible hair-clog extractor; coat hanger; drain snake; or tongue-and-groove pliers, for taking apart the P-trap assembly to clean it by hand. Most hardwood floors are finished with polyurethane. This means the surface of the floor is plastic, not wood. Therefore, there's no reason to use a "wood soap" or oil soap on a polyurethaned floor. In fact, many flooring experts, including The World Floor Covering Association, recommend not using oil soaps on hardwood floors, warning that the soaps can dull the finish and impair your ability to recoat the floor with the same finish (which is a lot easier than sanding it down and refinishing). The same warning applies to all "wood floor" products containing wax. The right tool for the job: A towel slightly dampened with clean water. Cedar and redwood are commonly used as "weather-resistant" lumber for outdoor projects. However, unless you're paying top dollar for all-heart cedar or redwood, chances are the lumber you're getting is only marginally or even negligibly more rot-resistant than most other softwoods. Generally speaking, only the heartwood (the dense, dead wood from the center of the tree) is naturally resistant to decay and some insects. The sapwood (from the softer outer layers of the tree) is not so. Low grades of this lumber may be all sapwood, and many higher grades contain a mixture of sapwood and heartwood, so the wood has to be painted or otherwise sealed for decay resistance. The right tool for the job: All-heart (or all-heartwood) cedar or redwood for above-ground applications; pressure-treated lumber rated for ground-contact for structural applications where the wood is in contact with the ground. Philip Schmidt writes for Networx. Get home & garden ideas like this on Networx.